The answer is a mini crisis on a Sunday night. 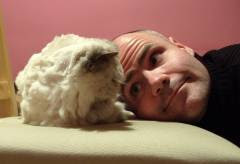 They say that when the cat's away, the mice play, but in our case, it's the cats who play up when Amelie's out of town. 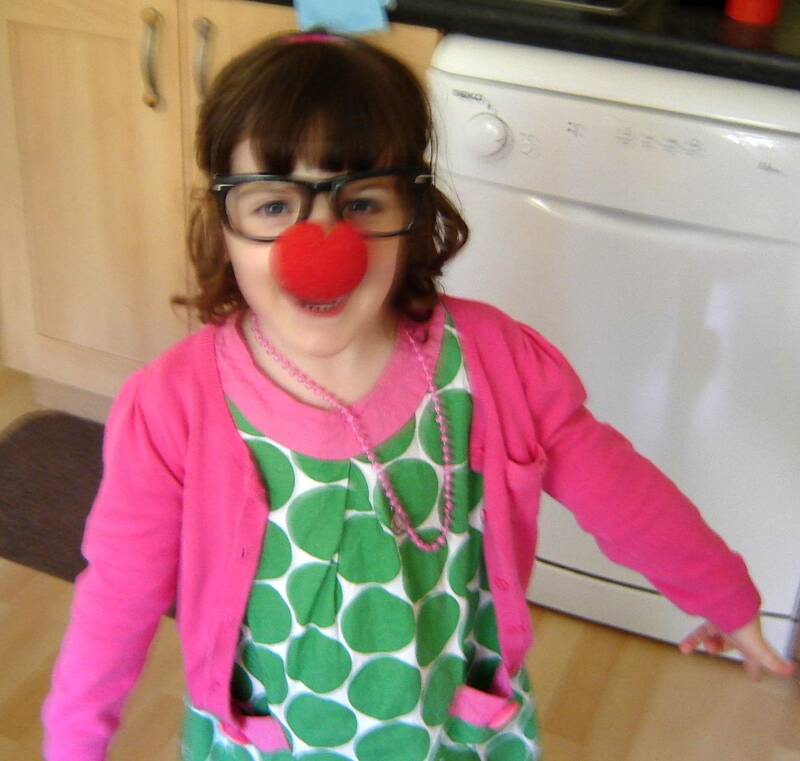 As the first photo above demonstrates, Amelie's spent the weekend dressing up as her Grandad in my parents' kitchen. We needed her out of the way so that we could raise a toast to the happy couple without being asked for more peanut butter. It also gave me the chance to write my article for the American ophthalmology journal. Which was a chance I miraculously took yesterday afternoon, after procrastinating since Friday. You would think that Amelie's absence would make the kittens' lives easier, but as it turned out, she managed to put the cat back into panic attack without even being here. Mainly because she left her bedroom unattended. I was in the bath at 9 o'clock last night when I suddenly heard Shimmy miaowing at the top of her voice. I naturally assumed that Lisa was terrorising the kittens by cuddling them against their mother's will, so I shouted at her to leave them alone, but she called back to say she hadn't touched them. When the miaowing continued, my first thought was that Shimmy was going into labour again, so I began to wonder if I should save my bath water to drown a new litter. 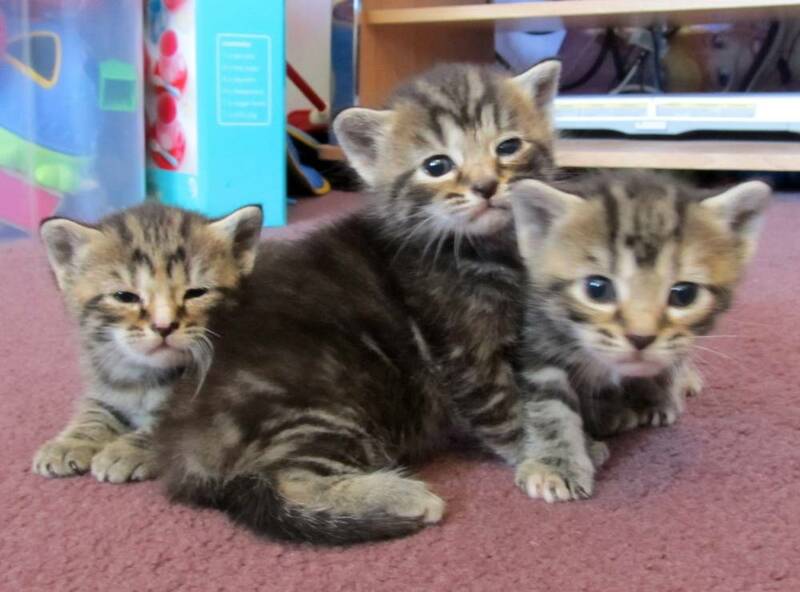 At which point Lisa broke the silence by shouting "The kittens have gone!" in a slightly panicked voice. Two minutes later, I was out of the bath and searching the flat in a towel. There were no kittens behind the TV, or anywhere in sight, but Shimmy was clearly trying to tell us something. Namely that she was in a parenting pickle. It transpired that whilst I was in the bath, Lisa was in the kitchen and Amelie was in St Leonards, Shimmy had decided to move the kittens into Am's bedroom. Which is like entering the lion's den for a small cat, and something she'd never have done if the beast was in residence. Unfortunately, in her efforts to move house, Shimmy had managed to drop all three kittens behind Am's big armchair, before realising that she couldn't get down there herself. Which is when she'd turned to us for assistance. So while Shimmy shouted her encouragement, I proceeded to move Amelie's bed, a CD rack, my big guitar case, two toy boxes and an armchair, before squeezing into the corner of the bedroom and retrieving three small kittens. We then shut her out of there before she did it again. Ironically, despite having come close to losing her offspring in a freak armchair-related accident, Shimmy refused to move the kittens back to the safety of the princess tent. And she wouldn't leave them in the cat bed under the table either. So they're now behind the sofa in the living room. It's their third home in as many weeks. They're like a trio of big fat gypsies. Shimmy is a very responsible mother, but none of us can quite understand the way her mind works - not even Lisa! !